Sunday WOD is now at 1800, please pass the word. 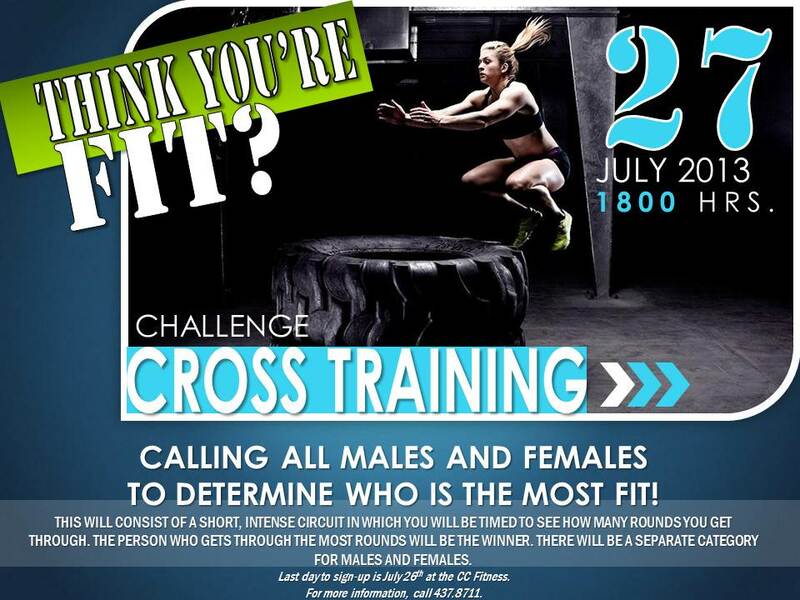 The base Non-Crossfit Competition (Function Fitness Challenge is the actual name of it) is this Saturday. It is a partner WOD (guy/guy, girl/girl, or guy/girl) They are having A LOT of people sign up and might be putting a cap on participation so sign up soon at the CC gym. I expect anyone who is part of CFU to participate. I know Camrin is usually our hydration guru but I have one tip for everyone...If you are having to grab water in the middle of a WOD, that is an indication that you did not drink enough water during they day. I know it is hot out there but the human body is pretty amazing as keeping us cool, provided we have fueled it right. So concentrate on drinking enough water during the day because by the time you feel thirsty during the WOD, you are already dehydrated. Many of our workouts are total sprints and taking breaks for water defeats the purpose. So to sum up, you should drink enough water throughout the day that you do not need to take water breaks during a WOD. Of course post-WOD, drink all the water you want. Complete one pullup on the first minute, 2 on the second, 3 on the third, etc. until you cannot complete the set within a minute.